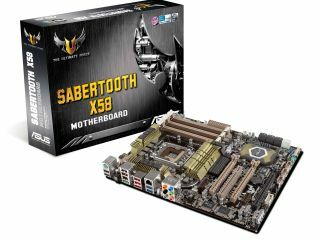 Asus has unveiled the new Sabertooth X58 motherboard – the latest addition to its TUF series of heavy duty motherboards. The TUF Series are built around the ethos of offering reliability and endurance above all else, and the Asus Sabretooth X58 is the latest entry in the 'ruggedised' line-up. "They are built with more rigorous stress testing than normal motherboards, and ship with added longevity measures," explains Asus. "TUF Series motherboards are the most reliable and stable models on the market, making them ideal for tough, heavy duty tasks where compatibility is critical." The ATX board offers a new thermal design using CeraM!x Heatsink Coating technology and also offers the military grade testing usual to the range. As you would expect given the name – this motherboard is built around the X59 chipset and supports the latest Core i7 chips. The specs include support for up to 24GB triple channel RAM, two PCIe 2.0 x16 slots, one PCIe x16 slot, two PCIe x1 slots and one PCI slot. Storage wise there is two SATA 6Gb/s, six SATA 3Gb/s, one power eSATA 3Gb/s and one eSATA 3Gb/s. Also noteworthy are the Gigabit LAN, 8-channel high definition audio and two USB 3.0 ports (plus 12 USB 2.0 ports).